Research on iconicity and sound symbolism has long focused on how iconic associations are made — finding universal crossmodal associations using pseudowords like bouba and kiki, and trying to understand what makes ideophones (and aspects of sign language) iconic and how they may help learning. This is great, but to understand underlying processes, we also need to understand what happens when we break iconicity. When you break a system (carefully, in a controlled way), you can get a new view of its internals. We need more work on breaking iconicity. What makes it dissipate from the lexicon? Which cues do we need to remove to make ideophones harder to guess? What happens to learning if we mess with the link between form and meaning? Under which circumstances is iconic sensitivity disrupted? Is iconicity more ‘broken’ in some people than in others, and what can we learn from individual differences? 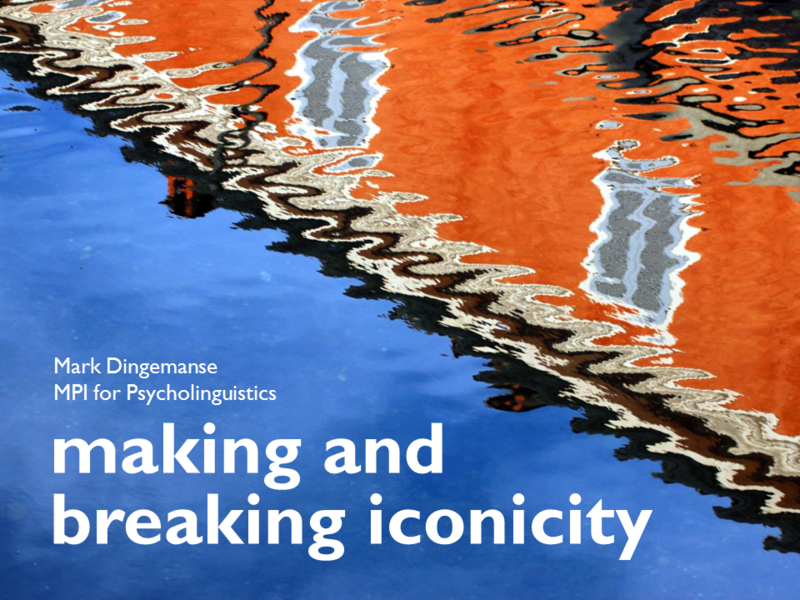 If we want to understand the linguistic mechanisms and cognitive processes involved in lexical iconicity, breaking iconicity is as important methodologically as making it. In a corpus study of Japanese, we found that ideophones lose their prosodic foregrounding (and thereby a significant part of their iconic cues) when they become more deeply integrated in the utterance. Here’s to more work trying to break iconicity! Here’s the abstract for the keynote lecture I’ll be giving at the 11th Symposium on Iconicity in Language and Literature in Brighton, April 6-8, 2017 (site). The notion of iconicity has seen a remarkable increase in prominence in recent years. No longer the marginal phenomenon it once was, it has become a canvas upon which we paint our wildest dreams about lexical structure, language learning, and the evolution of communication. Amid the flurry of exciting work it is sometimes hard to see what exactly iconicity is. Some divide it into subtypes, treating it as a semiotic relationship that comes in kinds. Others measure it by graded judgements, treating it as a substance that comes in degrees. Yet others use it as a predictor variable in experimental work, treating it as a property that can be present or absent. These diverse operationalizations point to a need for clarity about the empirical foundations of iconicity. Here I approach this goal from the perspective of research on ideophones, vivid sensory words found in many of the world’s spoken languages. Studies of ideophones have it all: daring claims of pervasive iconicity down to the level of speech sounds, counterarguments positing the utter irrelevance of anything iconic, and a variety of approaches trying to chart a middle way between these extremes. I report on a series of linguistic and experimental investigations of iconicity in ideophones. Starting from the use of ideophones in conversation —the primordial ecology of language and verbal art— I show that they are best understood as multimodal depictions: communicative acts that invite us to imagine what it is like to perceive the scene depicted. This basic fact helps explain a range of cross-linguistic observations about ideophones: from their marked forms to their special morphosyntax, and from their sensory semantics to their uses as direct appeals to experience. Careful psycholinguistic experimentation allows us to see how phonemes and prosody can come to function as iconic cues, why iconic ideophones are easier to learn than arbitrary adjectives, and how the cross-modal associations they thrive on may be related to synaesthesia. Ideophones challenge us to take a fresh look at language and consider how it is that our communication system combines multiple modes of representation. Dingemanse, M., Schuerman, W., Reinisch, E., Tufvesson, S., & Mitterer, H. (2016).What sound symbolism can and cannot do: testing the iconicity of ideophones from five languages. Language, 92(2), e117-e133. doi:10.1353/lan.2016.0034. Dingemanse, M., Blasi, D.E., Lupyan, G., Christiansen, M.H. & Monaghan, P. (2015). 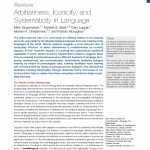 Arbitrariness, iconicity and systematicity in language. Trends in Cognitive Sciences, 19, 10, 603-615. doi:10.1016/j.tics.2015.07.013. Dingemanse, M. & Akita, K. 2016. An inverse relation between expressiveness and grammatical integration: on the morphosyntactic typology of ideophones, with special reference to Japanese. 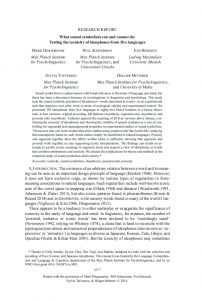 Journal of Linguistics. doi:10.1017/S002222671600030X. Dingemanse, M. (2012). Coerced iconicity in writing and speech. SemiotiX New Series, no. 8. What do you really need on this earth? Natural conversations are a great source of data for all sorts of linguistic research. Linguists and conversation analysts usually study them primarily for their structure, not their content. This is not out of disinterest, but out of empirical prudence. Talk tends to support a wide range of interpretations. It is empirically safest to stick to observable structures and practices, or at most to interpretations furnished by the interlocutors themselves. 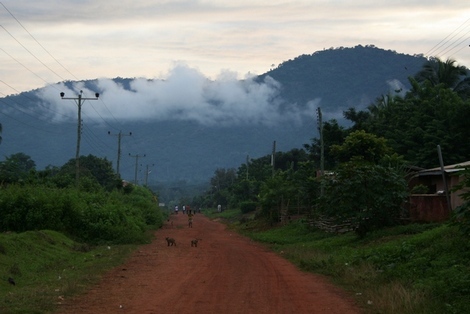 The excerpt below is translated from a corpus of natural conversations in Siwu, a language spoken in Ghana. Two elderly men are sitting in front of their house and chatting. They’ve just been talking about a fellow villager whose children are “giving him problems”. The long silence before Adom’s “So now.” signifies, among other things, that what comes now is likely a new topic. The exchange that follows is beautifully poetic both in terms of structure and topic. A You have uh (0.8) radio. A So then what really- what do you really need on this earth? A Just your bodily health. A while back some low quality citations started showing up on Google Scholar. They had titles like “CHAPTER 2 draft — email xyz@ab.edu” and it was hard find actual bibliographic metadata. Google Scholar seemed to have scraped random PDFs uploaded on Academia.edu and decided it was worth counting the citations in them even in the absence of proper metadata. I shared this on Twitter and promptly forgot about it. This is another one for which we’ve made available the stimuli —word lists and sound files— through OSF, contributing to our mission to make research from our lab replicable. Also, we have since replicated the results in a follow-up study where we also took EEG and individual difference measures. 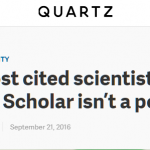 Note: I prepared this posting in August 2015, when PLOS ONE was due to publish a paper by us and I wanted to make sure they’d avoid the stupid typesetting errors they made in our 2013 paper. I used the numbers to convince them to show us proofs beforehand. To my surprise, they did, and I never got around to finishing the draft piece I had in the making. This week the issue flared up again following a comment by Dorothy Bishop, so I’ve decided to unearth my draft blog post and put it online. 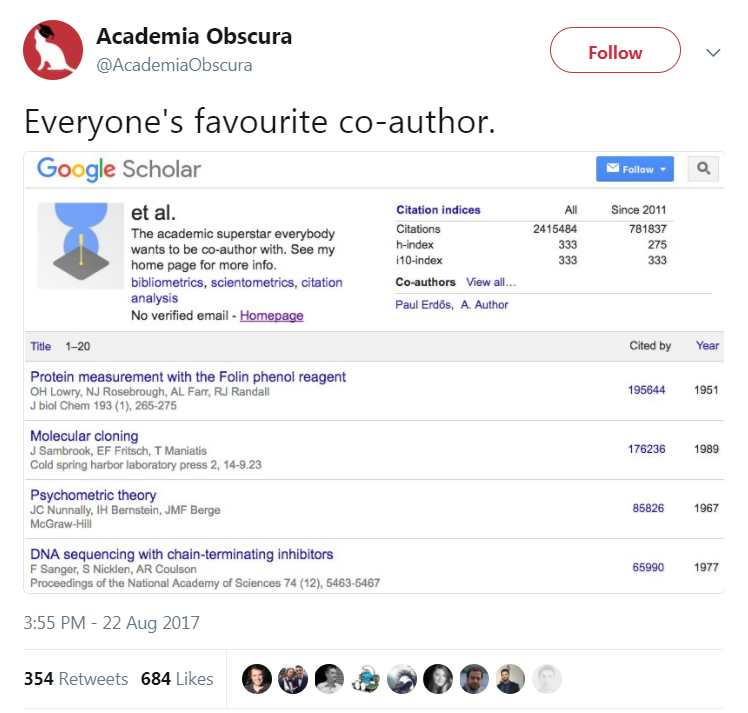 Summary: Google Scholar is great, but its inclusiveness and mix of automatically updated and hand-curated profiles means you should never take any of its numbers at face value. Case in point: the power couple Prof. Et Al and Dr. A. Author, whose profiles I created following Scholar’s recommended settings (and a bit of manual embellishment). 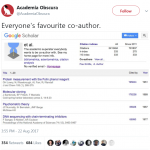 If you have a Scholar profile, make sure you don’t let Scholar update the publication list automatically. If you’re looking at somebody else’s profile, take it with a big pinch of salt, especially when they have a reasonably common name or when messy entries or weird citation distributions indicate that it is being automatically updated.